We have looked at the need for acceptance, love and guidance – now we see the ministry and life impact of these key values. Young people taking their place as full and active members of the body of Christ – bringing their passion, gifts, drive and vision – or do they? What space do we create in Church for young people to fully participate? IF we want to see young people remain in the church into adulthood we MUST equip them to serve and get stuck in. They need to know it matters whether they ‘show up’ or not. I love the film Gladiator! It’s up there as one of my all time favourite films. 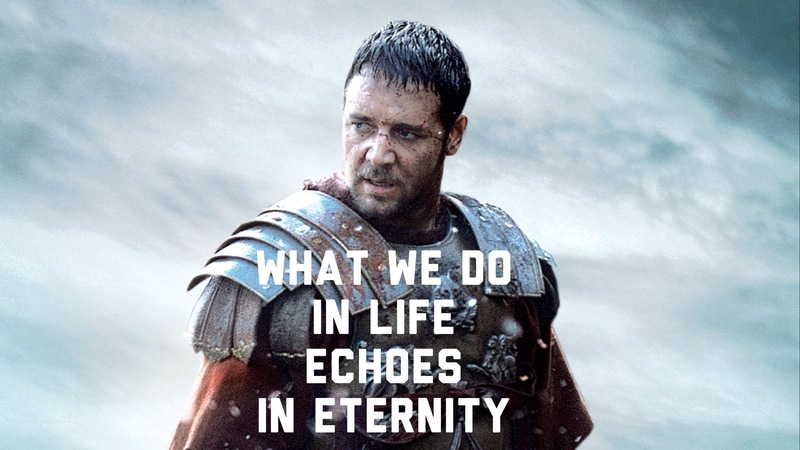 Near the beginning Maximus (Russell Crowe) makes a glorious speech and reminds his men that what we do – echoes in eternity. What we do matters. Do our young people believe that? Come to that – do we believe that? I have had a few chats over the years with some well known Christian leaders. One I spoke to a while ago said that when he hit 50 he realised what really mattered in life and ministry was not whether he was ‘successful’, but whether what he did mattered. Was it significant. Had it made an impact and a difference for the common good and for the gospel? That had become his question. We don’t ‘disappear’ when we live like this, we simply become more fully who we were created to be. The attitude we have of ‘Christ increasing’ can ONLY be for our good and for the good of those around us. What’s not to like? With the right attitude so much can be done! This attitude leads us to be enablers and equippers of others – especially, if you are involved in youth work – young people. Don’t DO what you have been doing for years (and giving nobody else a look in) GIVE it away, create opportunities for others – YES, they will be significant in their own right with what they initiate and begin and kick off and take on . . . BUT, everybody begins with being given a CHANCE. Give young people a go. It can be done safely, if it goes pear shaped – YOU take the flack. If it goes AMAZING – give them the credit – build a safe place where young people can risk it, have a crack at something – and it is ok to mess up . . .
do everything with grumbling and arguing, so that you may become blameless and pure, “Children of God without fault in a warped and crooked generation.” Then you will shine among them like stars in the sky as you hold firmly to the word of life. Where it says, “hold firmly” this could also be translated “hold out” hold onto and hold out the word of life – it’s not one or the other – it’s both. You cannot hold out the word of life to others without firmly keeping it and knowing it and treasuring it – and, IF you have fully grasped it – you would not be holding onto it – such amazing love and grace is bestowed on us – we cannot keep it to ourselves! And – the stars! Shining like stars – that is the echo in eternity! If we shine like stars – then, maybe one day – the light from what we have done, been, passed on will reach others – long after we ourselves are gone (just like a star). THAT is the kind of leader of young people that I want to be. Let’s create space where young people know NOW they are significant and have a significant contribution to ministry and church life today; let’s find ways to get “out of the way” so they might get a glimpse of what they might do to serve Jesus and let’s give opportunities – HOW might young people serve your church today? Whatever age you are as a leader, whatever your have done so far to raise up and enable young people to take their place of significance in the church – there are always more young people! Let’s equip each other, let’s build up the whole body of Christ to be a place and a community that sees what God is doing in the lives our our children and young people and celebrates it by cheering the next generation on in all that God will call them to. They are fellow ‘runners’ of the race, they are in it NOW – not shuffling about on the sidelines waiting for us to finish! What you do by saying yes to one young person might transform their group of friends, a relationship at home, set them on the path to full time ministry, see them so boosted in their confidence they do stuff they never imagined they would or could. Some of it – we get to see (what a joy and an immense privilege) others things – we don’t see, we will never see – but God sees it all and knows it all. As we echo in eternity and as we shine like stars – the only one we need to know is watching (and loving every minute of it) is Jesus.